Has any generation ever gotten as much attention as millennials do? They’re called lazy, addicted to their phones, dependent on their parents, and entitled. Or, conversely, they’re lauded for being creative and entrepreneurial go-getters in challenging times. One thing’s for sure, though: When it comes to money matters, millennials (those born between the early 1980s and mid-1990s to early 2000s) are nothing like their parents or grandparents—and they’re trailblazing the ways of the future. 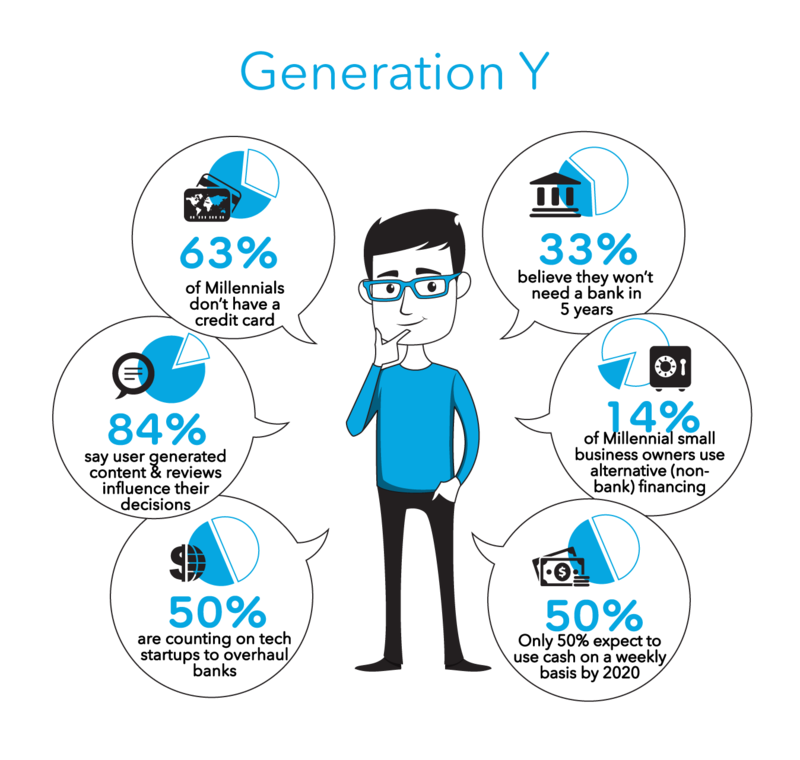 Having witnessed two recessions during their formative years and the collapse of markets and financial behemoths, millennials as a group are distrustful of huge banks, corporations, and institutions. At the same time, they’ve seen technology step in to address all sorts of problems and needs, from finding and communicating with doctors to ordering a cab late at night. They believe that technology can provide the answers, with 50 percent of them counting on tech startups to overhaul banks. Thirty-three percent of millennials believe they won’t need a bank in five years, and 14 percent of millennial small-business owners already use non-bank financing options. They are far more likely than Gen X-ers, Boomers, or Matures to donate money online or via a mobile device. For millennials, the days of handing over money—and trust—to a wealth management adviser and remaining passive are over. Likewise when it comes to borrowing and lending, paying, and financing new ventures. They are leading the charge in creating and adopting disruptive options in finance. Having grown up during the smartphone and social media era, millennials know that if they can share family photos on Facebook and ask for laptop recommendations on Twitter, their money doesn’t have to be locked away in bank vaults or the stock exchange. They also know that their knowledge and information about money doesn’t have to be limited to interactions with bank employees and stock market advisers. Millennials, in particular, are less invested in stocks (only 28 percent compared to 46 percent among non-millennials) and more likely to participate in crowdfunding—“47% of Millennial respondents have backed or are likely to back a crowdfunding campaign, compared to 30% of Gen-Xers, 13% of Boomers, and 4% of Matures,” according to Goldman Sachs. iintoo and other crowdfunding platforms, like Kickstarter and Indiegogo, harness the power of community to accomplish more. Individuals can now make a large impact even with small donations or investments. Today, a person can make an investment of just $25,000 in real estate and earn incomparable returns, something once limited exclusively to individuals with millions of dollars in their bank accounts. Developera, in turn, can access individual investors to help make their visions, and solutions a reality, all without tying up their assets, risking delays or other capital-related challenges. As of March 2015, $1.6 billion had been pledged on Kickstarter, with the single-largest campaign raising more than $18 million. Most entrepreneurs don’t have access to those levels of funding through their family-and-friend networks or by bootstrapping! The Jumpstart Our Business Startups Act (JOBS Act) passed in the US in 2012 makes it easier for small business to raise capital. Titles II and III, passed in 2013 and 2015 respectively, allow startups to raise funds publicly and enable equity crowdfunding. With small amounts of money, individual investors have unprecedented access and opportunity to do big things. iintoo is proud to be part of this new and exciting space at the crossroads of technology, socialization, and innovation in finance. Our team’s decades of combined knowledge, know-how, and experience in the real estate industry coupled with cutting-edge technology and vision make investing in real estate safe, easy, accessible, and, most importantly, potentially, highly lucrative for individual investors. Even with limited assets, individuals can make a great impact and earn back. Plus, in the process, they can join an equally rewarding social network and community of investors.